The Bugatti Chiron debuted at the 2016 Geneva Motor Show, succeeding the Veyron. Production started a year later. In the not too distant future AUTOart will be releasing four 1:18 replicas of this incredible car. The main carryover component from the Veyron to the Chiron was the eight-litre, quad-turbocharged W16 engine, albeit in a heavily modified form. The car is electronically limited to 261 mph because, to paraphrase Lord Flashheart, ‘the tyres haven’t been built yet to take the job on’! 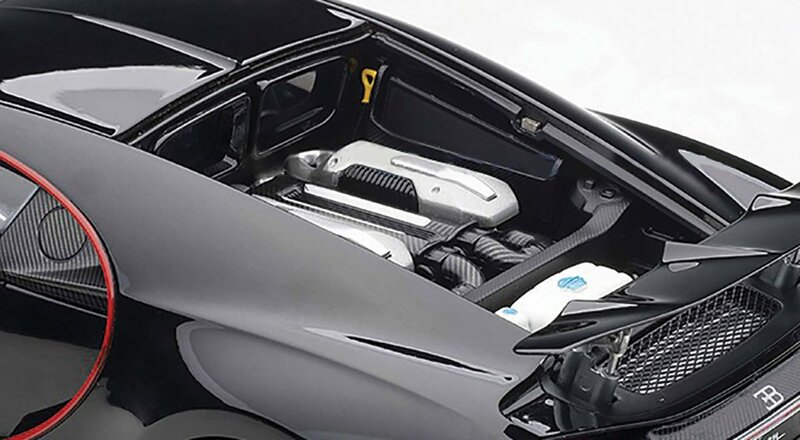 AUTOart’s 1:18 replica of the Chiron will come with all the bells and whistles, like removable bodywork around the engine and a retractable rear spoiler. Obviously, opening doors and bonnet are a given. We have estimated a price of £329.99 for the moment, as AUTOart is unique in not confirming the RRPs of its replicas until their release is imminent. Place your pre-order now, and you will be charged the confirmed RRP when AUTOart announces it.